Located in historic Liberty Corner, we are a small farming operation specializing in 100% organic vegetables, herbs, flowers, hay and straw and non-certified lamb. We started our farm in 1995 raising sheep and growing herbs on an old chicken farm that had ceased operation in the 1960s. After many years of working on the infrastructure, while busy at our day jobs, we finally have the barns, greenhouse and high tunnels to help our operation run smoothly, relatively. 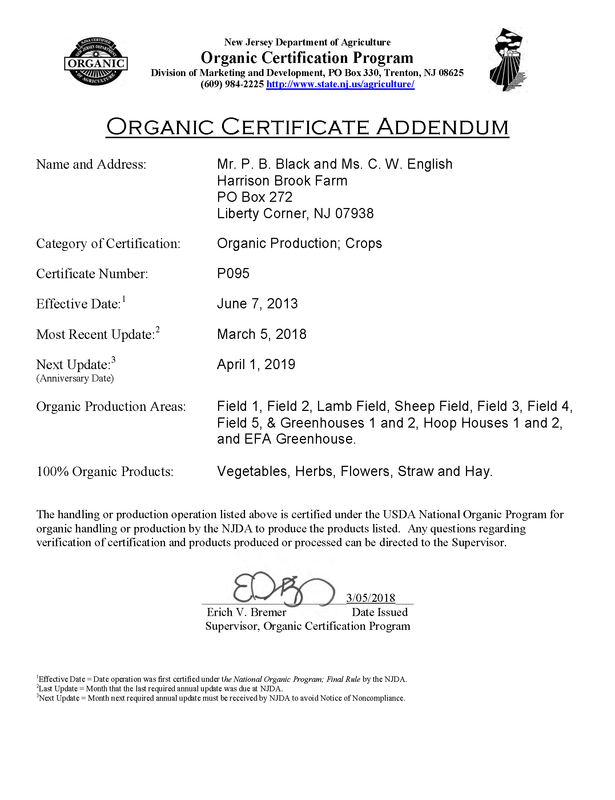 Throughout this transition process we made sure to only use organically approved products and practices in preparation for our long term goal to become USDA officially certified organic. 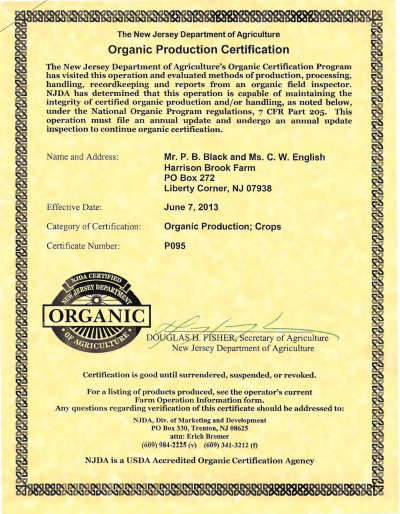 We obtained organic certification from the certifying agent representing the USDA in 2013 on our very first attempt. The certification process though, is not a single time application event. Each year we must submit an update and undergo an on-site audit by an independent auditor from which the certifying agent makes a decision on certification status. We continue to meet all the requirements and successfully maintain our 100% certification for vegetables, herbs, flowers, straw and hay. Our products are sold through vendors such as English Farm.